Our newsletters are choc-full of great deals, tempting competitions and recipes. 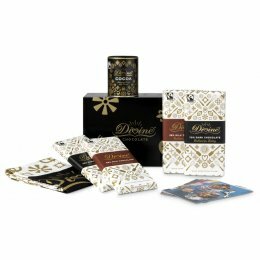 For a generous gift to impress, look no further than these delicious Divine Hampers bursting with a variety of fabulous flavours, which will delight chocolate lovers as they discover something special to share and enjoy. Kuapa Kokoo is a co-operative of over 80,000 cocoa farmers in Ghana, who own the largest share of Divine Chocolate. It means farmers receive 44% of profits, as well as a fair price for their cocoa. So when you buy Divine Chocolate, you can feel good that the farmers that grow the finest quality Ghanaian cocoa beans are benefiting too. It’s a gift that keeps on giving! © 2016, Divine Chocolate Ltd. Divine and Dubble logos are registered trade names and trade marks of Divine Chocolate Limited.